The Sun has attracted the attention of mankind for adoration all over the world from the very beginning of human history. It has attained the position of preeminence among the deities of nature in ancient times. Sun-worship in ancient India has been significant from many points of view. 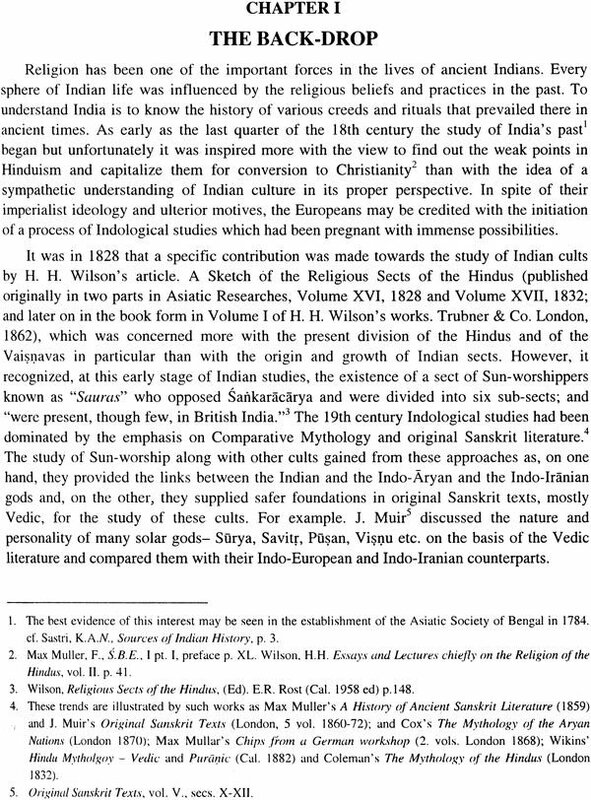 The continuity of Sun-worship from the prehistoric times to the present day and its universality and popularity among all classes of human society make its study as one of the most illuminating topics of Indology. The Gayatri hymn dedicated to Savitr- the Sun-god in his aspect of stimulation, enjoyed to every twice born Hindu and practiced by many everyday from Tgvedic to modern times, is a positive proof of the continuity and universality of Sun-worship in its elevated and spiritual aspect. Likewise the practice of Arghya to the solar orb in many domestic as well as funeral rites of every Hindu even after the lapse of thousand of years after its beginning in the Vedic age is symptomatic of the vitality, strength and vigour of Sun-worship in India. In the present work the author has studied a religious system which has not received as much attention from the scholars as its should have done. The work present successfully a historical study of Sun-worship in ancient India right form its earliest beginning in the protohistoric period to its maturity in the early mediaeval period (8th-13th century A.D.); and is the first of its kind, being based on a thorough, critical examination of a wide range of literary sources and the correlation of the data gleaned from them with an equally wide range of archaeological data. The Sun has attracted the attention of mankind for adoration all over the world from the very beginning of human history. It has attained the position of pre-eminence among the deities of nature in ancient times. The prominence and glory of the solar orb, its beauty and splendour, its importance in the creation and maintenance of life, its regularity in diffusing light and enlightening the whole earth, its primal role in the cosmic evolution and consequent mystery surrounding it, had secured for the Sun a history of interest and importance equaled by none to which every age and every race has contributed its pages. It was this realization which led Sir William Jones, E.B. Tylor, W.T. 01ccot, and many others to suggest that one great fountain of all idolatry in the four quarters of the globe was veneration paid by men to the Sun. A firm conviction in the divinity and worship of the Sun has formed an essential feature of the religious and spiritual consciousness of Indians throughout their history. In India, Sun-worship originated as early as the Neolithic period as in other countries. Its worship by means of symbols continued to be an integral part of the religious life of the protohistoric peoples. The advent of the Aryans brought new streams of religious thought which contained a strong belief in the divinity of the Sun. The Vedic Aryans adored it under various forms and names- Surya, Savitr, Mitra, Visnu, Pusan, Asvins, Adityas, Rohita, Vivasvat etc. by means of recitation of hymns of praise and prayer; and oblations and libations. It figured prominently in the Brahmanic rituals. In the Upanisads the Sun is regarded as the best manifestation of the Supreme power. 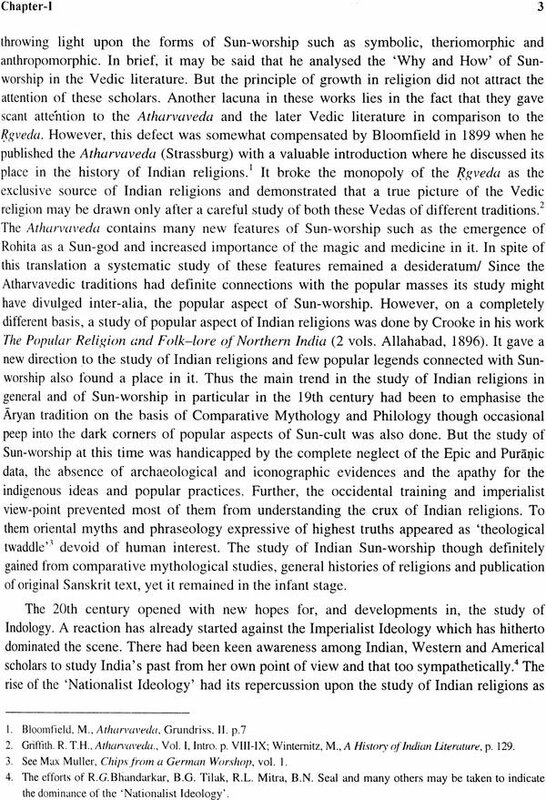 Sun-worship of the Indo-Aryans had a powerful spiritual background. The intermingling of the Aryan and non-Aryan traditions of Sun-worship led to the emergence of a Sun-sect mentioned for the first time in the Mahabharata. It's antiquity may be pushed back to the 5th-4th Cent. B.C. Ithad derived inspiration from both the streams. At this very time the Sun-worshipping Iranian (Medean) priests known as Magas appeared to have entered into the north-western India - a fact which must have helped in the evolution of the Sun-sect. The Magian tradition became quite popular in the Saka- Kusana period and was ultimately responsible for popularising the traditions of Sun-images and temples. 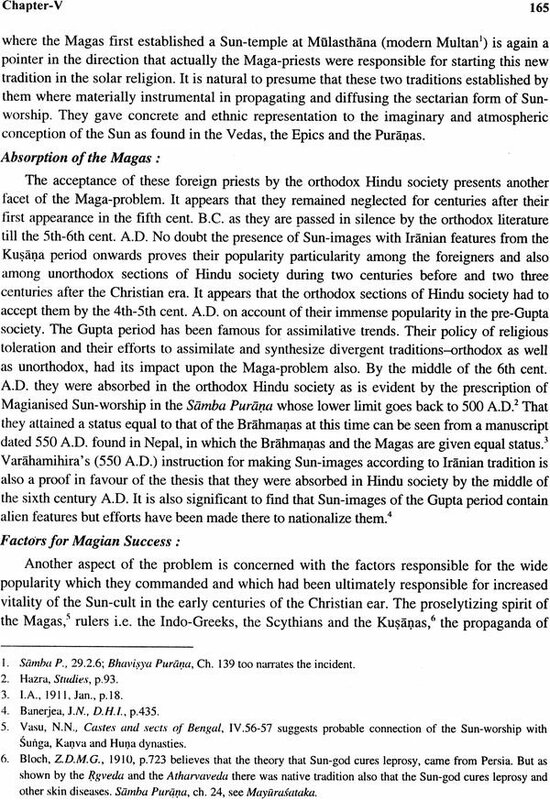 In the Gupta period the Magas came to be recognised even by the orthodox sections of Hindu society. 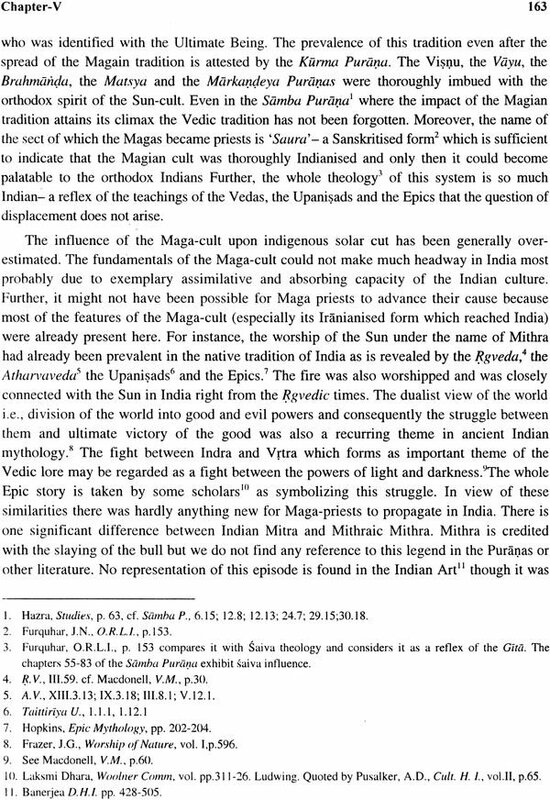 In the Puranic Sun worship all these traditions - indigenous, Aryan and Magian are intermingled. There is an effort, as is customary with the Puranas, to harmonise these divergent traditions and present a synthetic picture of the Sun-cult under the Indian grab. The popular side of Puranic Sun-worship is represented by many solar vratas and tirthas mentioned in the Puranas. The sectarian Sun- worship is fully reflected in the later Puranas like the Bhavisya and Samba. From the 8th Cent. A.D. onwards Tantric traditions came to exert powerful influence on the Sun-cult particularly on its methodology as we find references to Tantric practices in Sun-worship. At this very time Saiva ideology and practices also came to overpower the Sun-cult so much so that common worshipper failed to find any difference between Surya and Siva. Even an intellectual fell a prey to such indiscrimination as a Saivite Purana is actually entitled Surya-Purana. 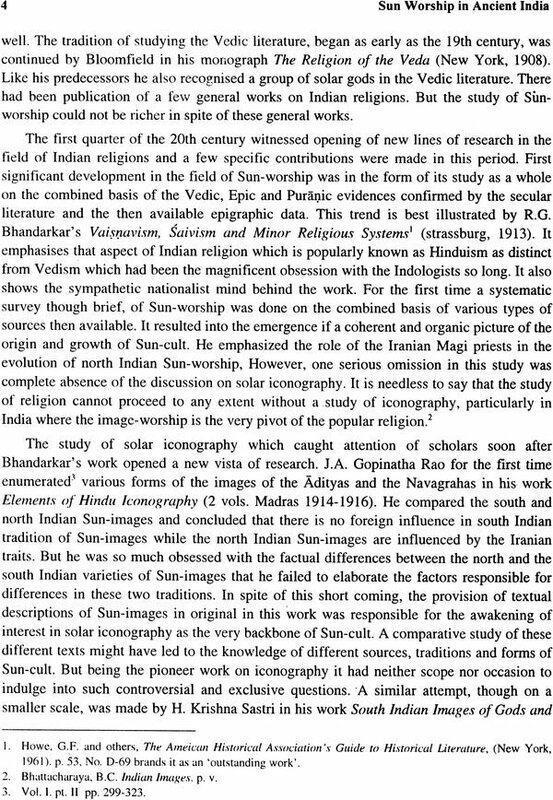 This brief review shows that there was hardly any period of ancient Indian history when Sun-worship would have been non-existent. 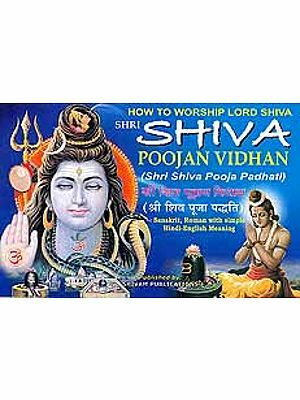 It is on account of this that it had been described as the real religion of India, the only one which has really been able to rival those of Visnu and Siva and the most powerful of all these religions of the Hindus. It was so prominent and all-pervasive in ancient India that a school of solar mythologists arose in modern times to explain the origin of most of the Vedic gods on solar basis. 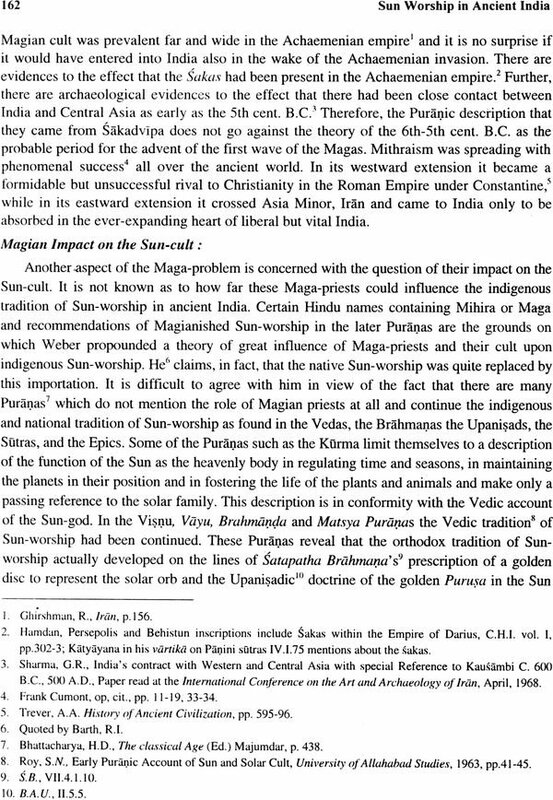 Sun-worship in ancient India has been significant from many points of view. The continuity of Sun-worship from the prehistoric times to the present day and its universality and popularity among all classes of human society make its study as one of the most illuminating topics of Indology. The Gayatri hymn dedicated to Savitr - the Sun-god in his aspect of stimulation, enjoyed to every twice born Hindu and practised by many everyday from Rgvedic to modern times, is a positive proof of the continuity and universality of Sun- worship in its elevated and spiritual aspect. Likewise the practice of Arghya to the solar orb in many domestic as well as funeral rites of every Hindu even after the lapse of thousands of years after its beginning in the Vedic age is symptomatic of the vitality, strength and vigour of Sun-worship in India. Further, the prominent role that the Sun-gods played in many vows and rituals of the Hindus is an indication of its popularity among all sections of Indian society. In the high philosophy of India the Sun was regarded as the best symbol of the supreme reality. In its orb there is a Purusa who is the personal aspect of that ultimate power which resides in his Purusa and which is everywhere. In spite of this philosophy Sun-worship is one of the simplest systems of religious belief. There is no subtle and complicated philosophy behind its worship, no costly ritual is needed to please the Sun-god, no high mysticism is developed in this system. Its worship revolved round the simple affair of offering water and flower to the orb, and recitation of mantras. The public-worship of the Sun developed on the lines of other cult-deities like Visnu and Siva but it is the non- sectarian, general worship of the Sun which is the real soul of the solar religion. Broadly speaking, there may be two types of approach to the study of Sun-worship in ancient India. The Study of basic ideals and conceptions underlying Sun-worship in different periods may form one approach. The literary evidence is of primary importance for this type of study. However, the iconographic and archaeological evidences are to be taken into account to corroborate and confirm the data gleaned from literature. Another approach may be to deal with local cult-details as is evidenced by various regional iconographical and archaeological pieces. In the present work, I have approached the subject from the first point of view. My aim has been to trace the successive development of the basic ideals of Sun-worship as reflected primarily in the Brahmanic literature of India as is clear from chapters III, IV, and V. The non-Brahmanic literature, the archaeological, iconographical and epigraphic evidences have been taken into account (Chapter II, VI and Appendix A) with a view to confirming and corroborating the data gleaned from the Brahmanic sources. The present work is divided into seven chapters. The first chapter is concerned with a sort of stock-taking of the works done on the subject in the past. 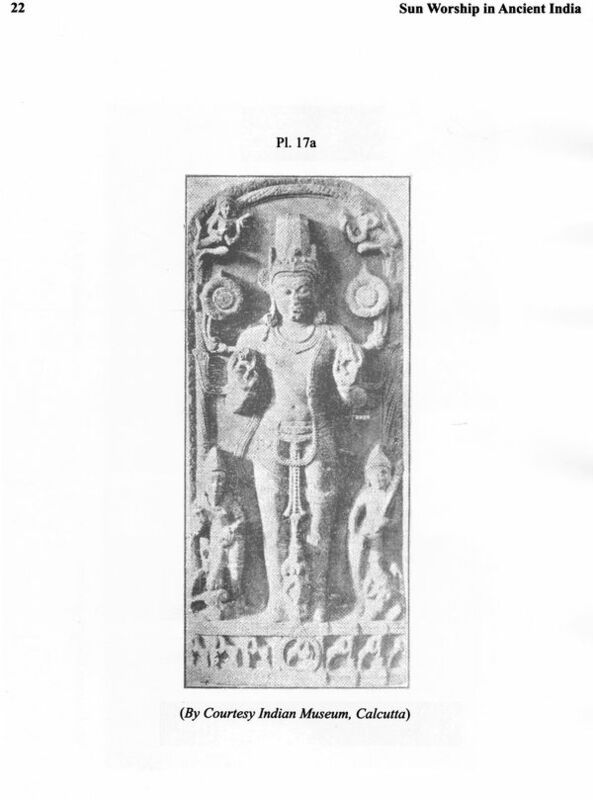 The second chapter gives an account of the various symbols and forms of Sun-worship in prehistoric and protohistoric cultures of India and leads us to the conclusion that Sun-worship had its earliest beginning in the Neolithic age and its infant stage has been reached in the protohistoric period. 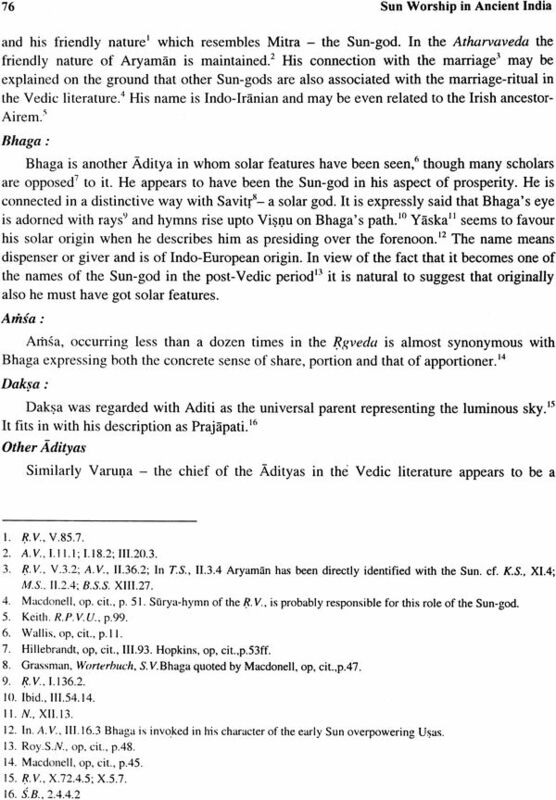 Thus it is historically not correct to begin the tory of Sun-worship from the Rgvedic period. 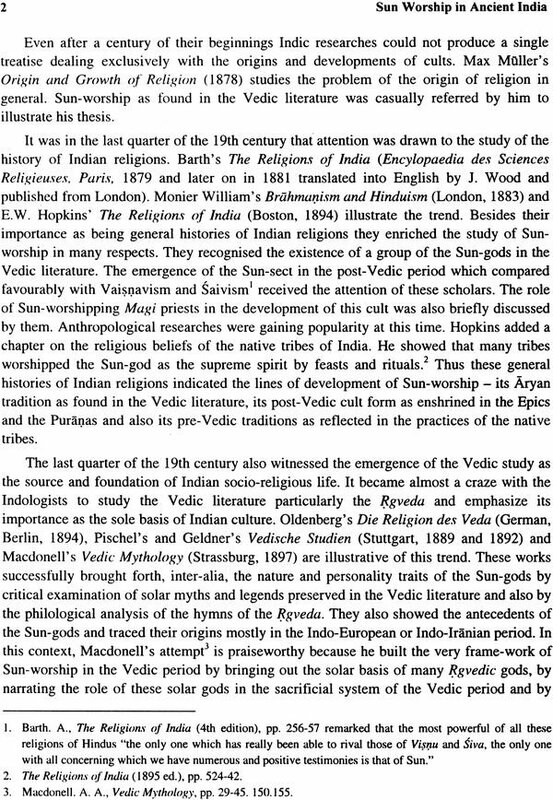 The third 'chapter deals with the Vedic tradition of Sun-worship on the basis of Vedic literature supported by Avesta and Indo-European and Indo-Iranian mythology. 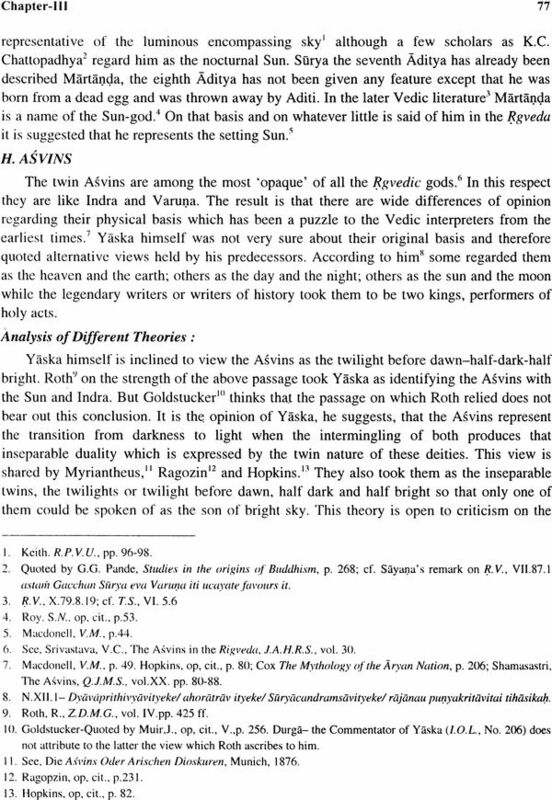 It discusses the solar basis of many Vedic gods- Surya, Savitr, Mitra, Visnu, Pusan, Vivasvat, Adityas, Asvins, Rohita. Vena etc. on the basis of Rgveda, later Sarnhitas, Brahrnanas, AraQyaka and Upanisads and Kalpasutras. From this discussion the Vedic concept of the Sun-god has been brought to light. 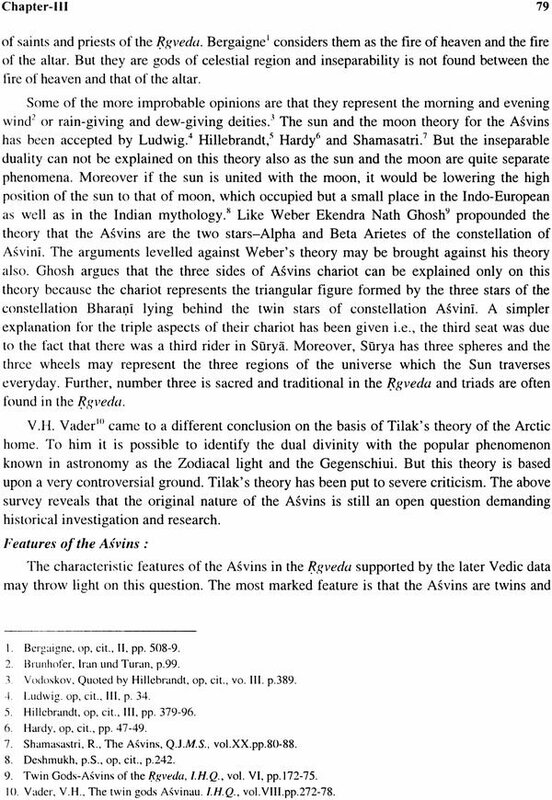 It is suggested, contrary to the prevailing view, that from the very beginning a highly spiritual concept of the Sun-god was developed by the Vedic Aryans. It has been shown that there existed a class of saints who were particularly devoted to Sun- worship and probably this devotion was a family heritage to them. This feature becomes quite marked in the later Vedic age. It cannot be suggested that there was a Sun-sect at this time but it is probable that Sun-worship was well on its way to sectarian road which ultimately culminated in the Epic stream of Sun-sect. The Vedic worship was domestic and aniconic. No doubt certain symbols came to be developed to serve as temporary images in this stage. The fourth chapter discusses the origin, antiquity and nature of the Sun-sect along with the features and qualities of the Sun-god in the Epics. The Epic data are corroborated by early Buddhist and Jain literatures, Panini and Patanjali and early coinage and iconography. It is shown that the Magas may have been present in north-western India in the 5th -4th centuries B.C., when the Epics may have been written atleast in their nucleus form. The Epic Sun-worship foreshadows the Puranic trends and thus serves as a link between the Vedic tradition and the Puranic world. 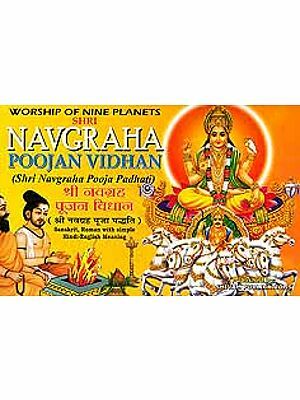 The chapter fifth traces the basic features of Sun- worship of the Puranic world and later Puranic world. In the first part the continuance of the Vedic and Epic traits is critically analysed. The early Puranas contain many new features of the Sun-cult such as the development of solar vows and festivals and the tacit approval of the iconic tradition. In the second part the growth of the Sun-sect with all its paraphernalia such as the development of a sectarian Saura literature, code of conduct for Sun- worshippers, complicated ritual of the Sun-cult etc., is critically examined. The problem of the antiquity, nature and extent of influence of the Magas which is one of the much debated questions of indology has been taken up in this section. A rather unconventional view has been suggested in this matter in the sense that the 5th cent. B.C. has been fixed as the probable period when the Magas appear to have entered into India for the first time in the wake of the Achaemenian invasion though they may have remained confined to north- western part of India. They appear to have failed to exert any appreciable impact on the Sun-cult. The second wave of the Magas which appears to have been a much more powerful wave entered in the wake of the Saka-Kusana invaders. This time they reached the very heart of India and were successful on account of royal patronage to them in developing the iconic and temple-royal patronage to them in developing the iconic and temple-traditions of the Sun-cult. The third wave appears to have come in the 7th cent. AD. in the wake of Parsee influx in India and this time they came to be called Yajakas or Bhojakas. The syncretic tendency in the Sun-cult is reviewed and the impact of Tantric mode of worship is also discussed in this chapter. The Puranic data are corroborated by secular literature, icons, foreigners' accounts and digest literature. The chapter sixth deals with the representations of Surya in ancient Indian art, and also the material remains of the Sun-cult. Firstly the representations of the Sun on early coins, seals and terracottas have been discussed with a view to understanding the necessary back-ground for the emergence of the iconic tradition of the Sun-cult. The study of solar iconography has been done under four periods-early, Kusan, Gupta and early medieval. 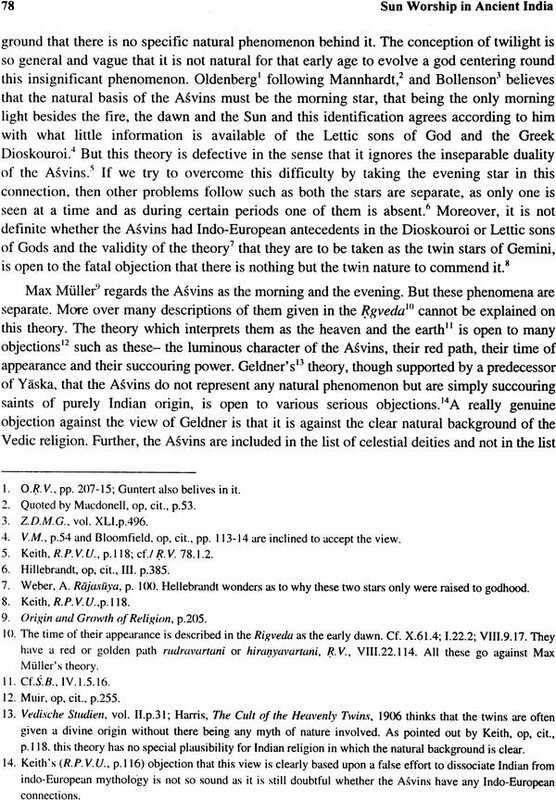 The problem of Hellenistic influence in the origin of Sun- images had been examined. The Iranian traits in the Sun- images of the Kusana period onwards have also been reviewed. 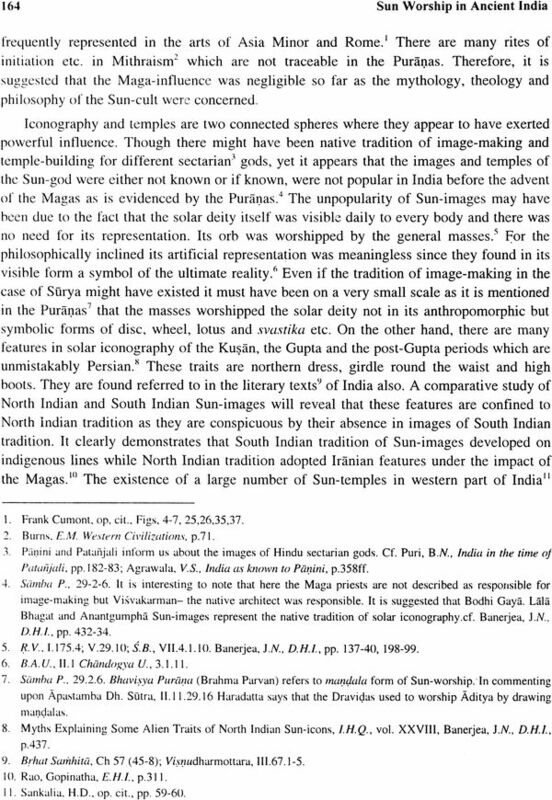 The trend of Indianisation in solar images started in the Gupta period. The typical Sun-image of the early medieval period have also been described and textual descriptions have been utilised to compare and contrast these traits with the actual specimens. 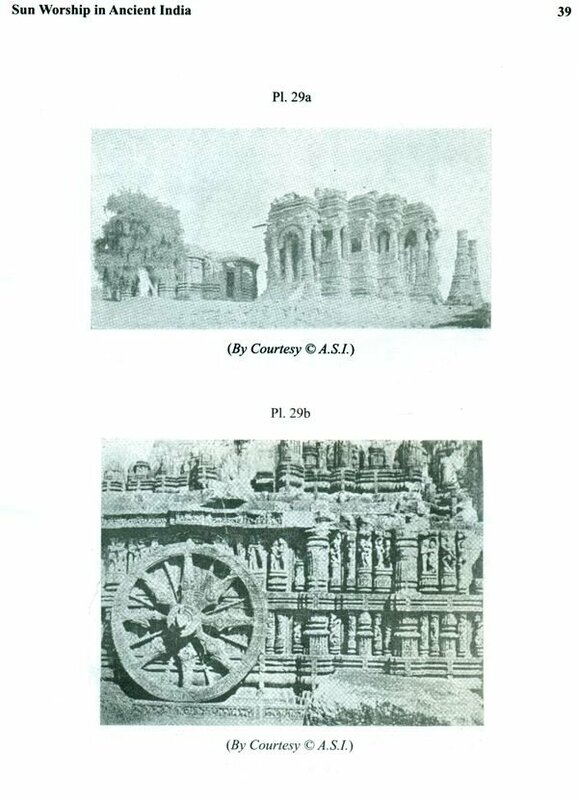 Lastly, the antiquity of the Sun-temple along with the description of a few important Sun-temples have been examined. The chapter seventh presents a historical' survey of the origin and development of Sun-worship. in relation to time, tradition and space. In the last Appendix 'A' has been added to provide with the epigraphic data on the Sun-cult in order to confirm and corroborate the data already gleaned from literary sources. The description of the division of the dissertation reveals that emphasis has been given on source-wise treatment of the subject. This reliance upon the source-wise treatment is mainly because of the fact that the dates of most of the literary works of ancient India are still unsettled and there are wide divergences of views in this respect so much so that difference may be to the extent of four-five centuries in many cases. Further, it is apprehended that there may be overlapping of periods among different classes of literature. Moreover, most of the works of ancient India have been written in one instance but at different times by different hands. There are much interpolations and later additions in many works. The result is that the period of most of the works extends in hundreds of years. 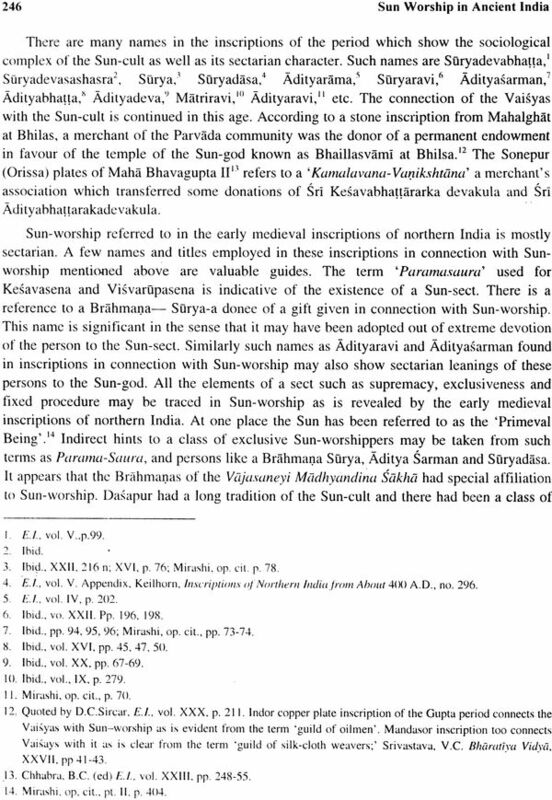 For example, the earliest portion of the Samba Up-Purana has been dated in circa 500 AD. while the latest in 1500 A.D. Similarly the earliest portion of the Mahabharata has been dated in 400 B.C. and the latest in 400 AD. at the earliest. Moreover, the different sources belong to different traditions having their own peculiarities. In view of such difficulties purely historical treatment based upon rigid and arbitrary periodisation is beset with unending controversy as the source materials which may be considered for one period by a student may be taken by others as belonging to other period. This misplacement of sources may result into wrong conclusion and distortion of source material in perspective of time and tradition. Moreover, it is believed that the date of any religious institution or belief cannot be fixed on the basis of the author or work which first mentions it because a belief or institution might exist much earlier than it finds expression in literature. Farnell's statement about Greek cults is equally applicable to Indian cults- "nor can we safely date a religious fact by the date of the author who first mentions it." Further, it is surmised that the source-wise treatment may be more exhaustive as the individual sources are studied exclusively at one place and conclusions may be correlated with other types of sources and traditions. Moreover, the source wide treatment cannot be regarded as unhistorical if we take history to mean not mere dates and years of events but the onwards march of the basic values of life in broad sequence and as the sources have been taken into descending sequence the history of the basic values of solar cult can be known by this method in a comfortable way. I am fully conscious of the fact that there is a great possibility of the repetition of ideas in different sources which I have tried to avoid as far as feasible. Since repetition of ideas in different sources only confirm the popularity and continuity of the ideas, there is always necessity of hinting them whenever and wherever they occur. It must be admitted that the solar cult of India has not received its due attention as is given to other cults. No independent study of the solar cult has been done so far, though a few articles appeared on some aspects of Sun-worship in journals as discussed in the first chapter. The materials for the study of this cult still lie hidden in the original sources and are scattered in journals. Here, therefore, I have been tempted to trod on an almost untrodden field-a field which is full of possibilities and thought-provoking investigations. 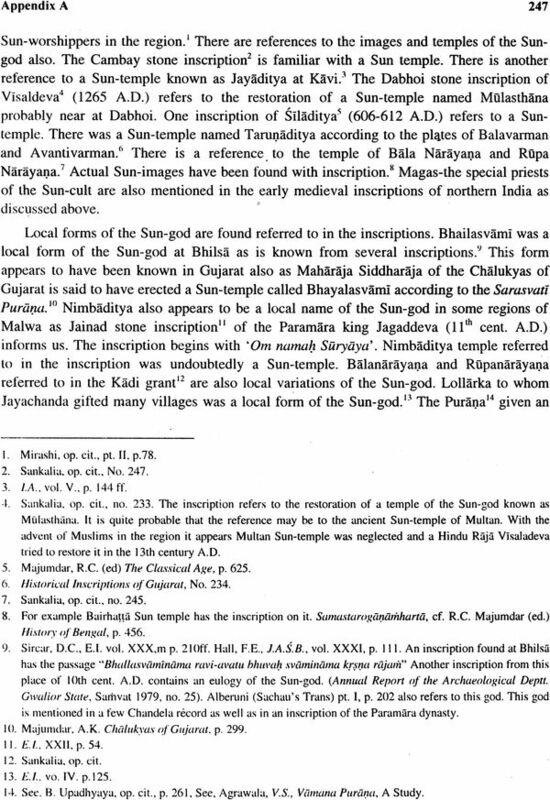 The present study of Sun-worship in ancient India has been done particularly with special reference to northern India from the beginning of history to the end of the ancient period i.e., 12-13th centuries A.D., though the south Indian tradition of solar cult is also referred to in order to bring into greater relief the north Indian tradition of Sun-worship. In the completion of the present work I have been helped by many in more ways than one and my acknowledgments are due to all. I am extremely grateful to Prof. A. L. Basham who has very kindly written the foreword in spite of his busiest term at this time. He has been very kind to me in going through the manuscript and suggesting to me many ideas regarding the arrangement of material before it was sent to the press in 1969. The present work has been completed under the able guidance and supervision of Prof. G.R Sharma. I am deeply beholden to him for the Introduction and all the guidance and help that he gave to me. I am also thankful to Prof. G.C. Pande, Prof. RS. Sharma and Prof. Lallanji Gopal who gave valuable suggestions and guidance to me. I am grateful to my teachers in the department-Prof. J.S. Negi, Dr. U.N. Roy and Dr. B.N.S. Yadava; and my colleagues- Dr. S.N. Roy, Dr. R.K. Varma, Sri V.D. Misra, Sri RK. Dwivedi, Sri S.C. Bhattacharya and others for various types of help, encouragement and guidance without which the work would not have seen the light of the day. Dr. Om Prakash and a few others have helped me in preparing the index to whom I am grateful. I express my sense of gratitude to my wife Smt. Madhuri Srivastava who helped me in various ways. I am thankful to Sri, G.R. Maini for typing the manuscript neatly, Messers Saraswati Block Works Alld, for making the blocks, the Indian Press Pvt. Ltd. Alld. for printing, Sri Ratnesh for proof reading and the Indological Publications for publishing the work. I am thankful to the University of Allahabad for permitting me to publish this work which has been developed out of my thesis submitted and accepted for D.Phil. degree of the university in 1968. I am thankful to Archaeological Survey of India, Archaeological Museum, Mathura; State Museum, Lucknow, and many others whose names are written below the plates for permitting me to reproduce their exhibits. Acknowledgments are due to all of them. I am regretfully aware of the fact that in spite of best care a few mistakes of proof- reading, particularly of diacritical marks, have crept into the work. I crave the indulgence of scholars for these lapses. While now there are no significant temples of the sun god still in worship in India, it is clear that at one time Surya, worshipped under many names, had numerous devotees and splendid temples all over India. Indeed what seems to have been the largest Hindu temple ever to be constructed, the great temple of Konarka, was dedicated to him. It is surprising that hitherto comparatively little work has been done on ancient Indian sun worship by Indian scholars. I am very glad that Dr. Srivastava has done much to meet the need by his thorough and detailed survey of the subject. 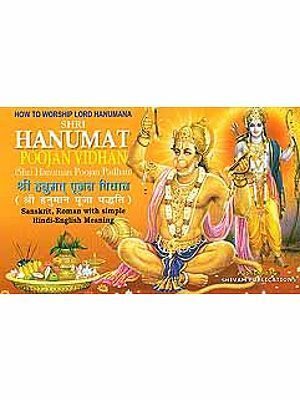 He has dealt with pre-Vedic and Vedic evidence, and has carried the story down to medieval times. His survey will be of great help to all students of Indian religious history. The historical study of religion and mythology which represented one of the most significant forms of social consciousness in early ages, is of singular importance for the relatively full knowledge of the ancient and medieval worlds. The growing realization of the value of this kind of study has been the natural outcome of the growth and expansion of historical consciousness in modern times. In the present work Dr. V.C. Srivastava has studied a religious system which has not received as much attention from the scholars as it should have done. 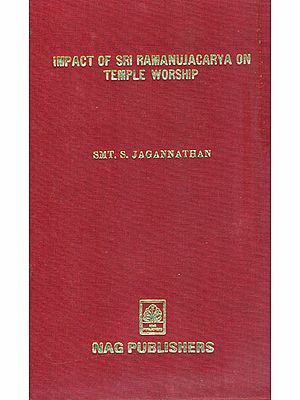 The work presents successfully a historical study of Sun-worship in ancient India right from its earliest beginning in the protohistoric period to its maturity in the early medieval period (8th-13th century A.D.); and is the first of its kind, being based on a thorough, critical examination of a wide range of literary sources and the correlation of the data gleaned from them with an equally wide range of archaeological data. The concern of history is not only the individual and in particular, it also attempts to investigate the relation between them and the general. Here the author has succeeded in rising above the variations of ideas and forms in the sphere of Sun-worship due to the factors of time and space, and in relating the individual and the particular, as gleaned from the archaeological and also literary sources, to the leading trends and tendencies of different phases. He is not wedded to any extreme ideology of historical interpretation and sees the development of a religious system as a product of diverse spiritual and socio-economic forces. Be ides giving new information about the indigenous tradition of Sun-worship in ancient India, the work throws valuable and interesting light on the antiquity and the extent of the role of the Iranian Magian priests in its development, on the nature and influence of the syncretic tendency, on the Hellenistic impact in the origin of Sun images, and on the various factors and stages in the evolution of this form of worship in the wider social and religious context. Dr. Srivastava has presented his finding in a lucid style and well-arranged fashion. I am glad to have the opportunity of introducing his study to the world of Indology. I am sure, scholars interested in Indology, will receive this valuable work well.